London Hotels, Guest houses and bed & breakfast accommodation in around near Soho all with real-time, confirmed online reservations. Soho is an area of London's West End in the City of Westminster. It is roughly the area bounded by Oxford Street to the north, Regent Street to the west, Piccadilly Circus and Leicester Square to the south, and Charing Cross Road in the east. The area to the west is known as Mayfair. Soho is near the heart of London's theatre area, and is a centre of the independent film and video industry as well as the television and film post-production industry. The British Board of Film Classification, formerly known as the British Board of Film Censors, can be found in Soho Square. 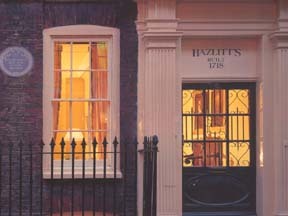 Ideally located in the heart of London's theatre land, Hazlitt's has an intimate charm no large hotel can match. We have set out to create the kind of accommodation we ourselves would love to find. 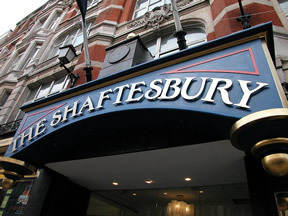 The Best Western Premier Shaftesbury Hotel Piccadilly is located right in the heart of London. In the heart of theatreland, it offers the perfect location to explore London.